A major aspect of being able to manage my diabetes is to regularly test my blood glucose levels. This involves inserting a test strip into a blood glucose machine, pricking my finger to draw blood and applying my blood to a test strip. Testing blood glucose levels (BGL) is a way for a diabetic to gauge what sort of levels they are working with. For someone without diabetes this isn’t necessary, as the body is able to keep the levels in a healthy range automatically. The body produces insulin and allows glucose to be released as energy. What are the healthy ranges you ask? In order for me to explain the levels a bit better. Please refer to my table below. After years of testing, it’s something that you don’t really get use to. For me, it became something that I had to do, even though at times it can be painful, it can leave marks and has hardened my finger tips. The harsh reality is, that it is a crucial part of being able to manage your diabetes. From the very beginning (at the age of 11), I tried as much as I could to take and record my BGL by myself. This was something which was encouraged during my time in the hospital and also at the diabetic clinic. However my parents supported me with this, but never pressured me. I felt comfortable to check my BGL and even inject in front of them and my siblings. They continued to except me for me, and never made me feel any different to them regardless of my condition. Throughout my 19 years as a diabetic, I’ve gone through my fair share of blood glucose machines. There is such a wide variety of blood glucose machines out there. Most blood glucose machines work in the same way. In the sense that you get a blood sample and a blood glucose result in the end.My first blood glucose machine was big and bulky, required a large sample of blood and took much longer to produce a blood glucose reading. 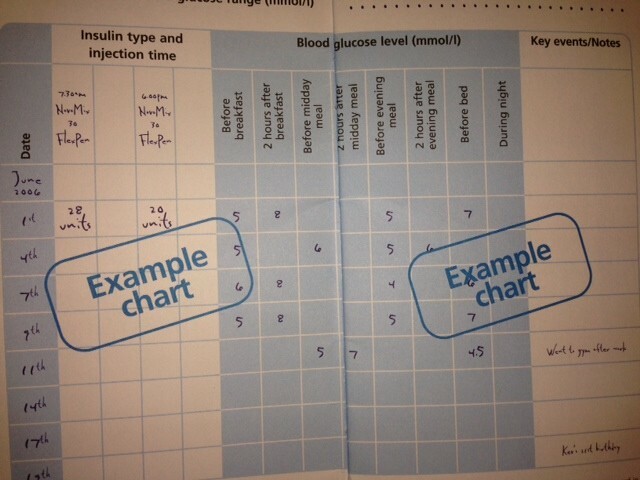 I was advised by my diabetes team to test my glucose before and 2 hours after my main meals. 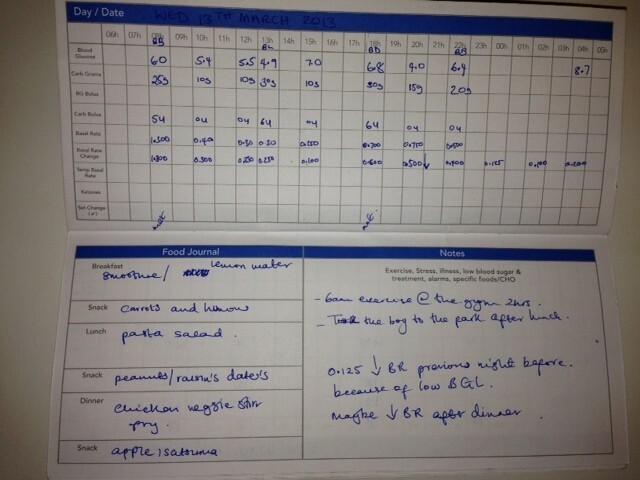 My blood glucose levels (BGL) would then be recorded in a log book like this. The log book allowed me to make notes of my insulin doses for that day, week etc. Also any general notes I wanted to jot down could be written in there. Now that I use an insulin pump my log books have changed and I tend to test a lot more frequently. 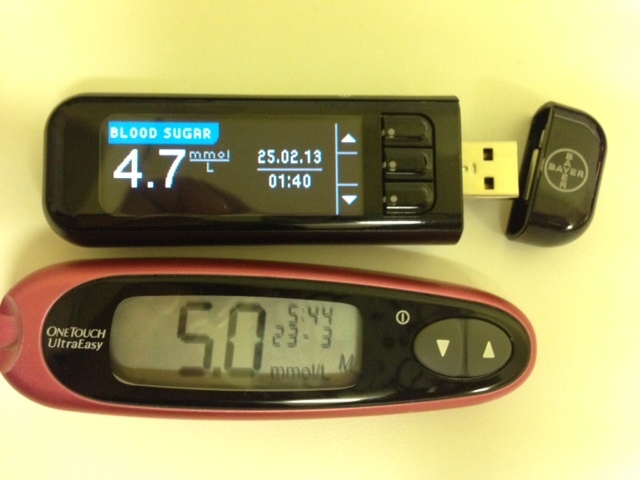 My blood glucose machines now are a lot more advanced and allow me to study the data a lot more closely. I enjoy formulating patterns and occurrences in blood glucose levels etc. (I think this is just the scientist in me). However, it does help me make changes or suggestions to my diabetic healthcare team during appointments. Here are the machines I’m using at the moment. It’s always good to have a backup machine. 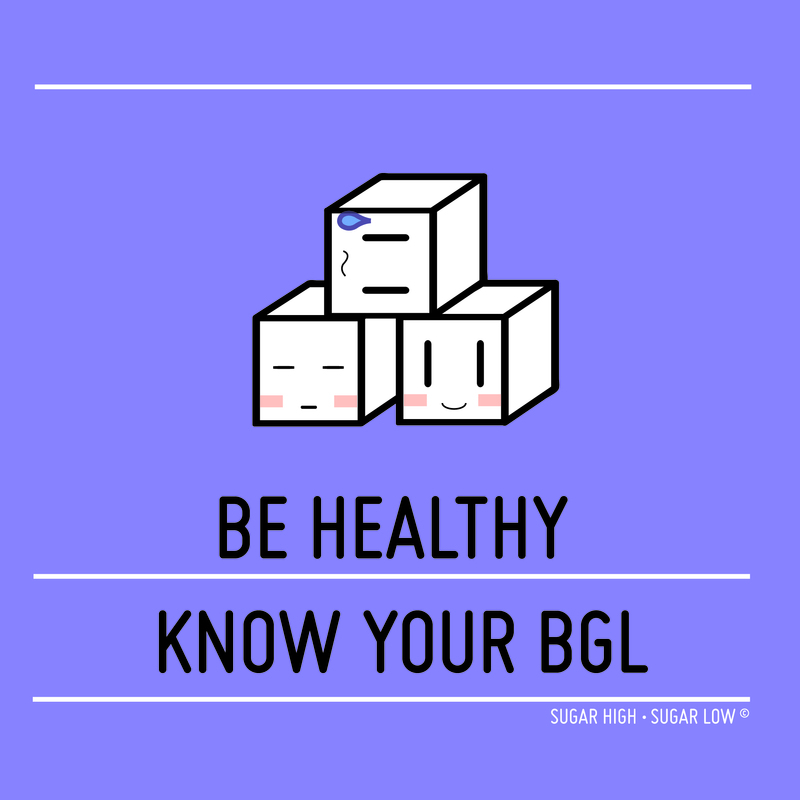 Choosing the right machine is extremely important, because essentially it will allow you to know what is happening with your BGL and help you to keep within a healthy range. Personally, I prefer something that is small, easy to carry and requires a small blood sample. Some insulin pumps, like the (Animas vibe) have the capability to continuously monitor blood glucose levels. These continuous CGM (Continuous Glucose Monitoring) glucose sensors are connected to the body and work with the insulin pump to retrieve blood glucose results. With the BGL’s retrieved, the CGM is able to formulate graphs. This comes in handy when it isn’t possible to test i.e. during the night, early morning, during a workout etc. The CGM is able to alert the user when blood glucose levels are increasing or decreasing. I hope to get my CGM sensor soon and will definitely share my experiences using one.